The PARTS SHEET (example seen below) can be drawn before or after the working drawing. If drawn before the working drawing it can be used to help construct and complete the parts list. Drawing each individual part ensures that you consider the size and shape of every piece. It will help you understand how many pieces of material need cutting, the type of material and overall sizes. Always add a little to the measurements of each piece, about five percent. This will allow for errors and for cutting the materials to each exact size and shape, when construction begins. It is good practice to draw each part, laying the parts out carefully on the paper. This is good industrial practice. For instance, when a flat pack of furniture arrives it will be accompanied by a sheet of instructions, the first being a drawing of each piece contained within the pack. See the example below. 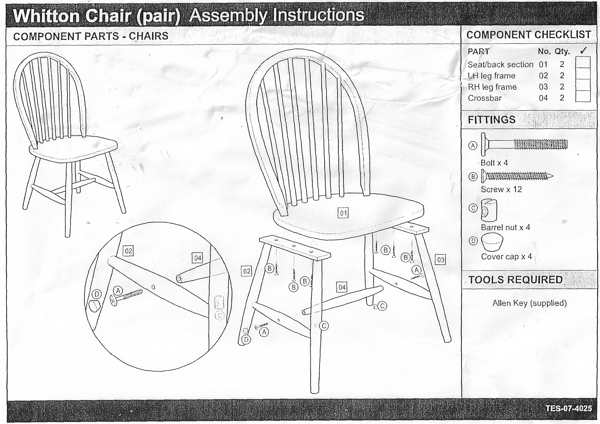 The parts sheet on the (seen at the top of the page) clearly shows all the parts with the exception of screws, hinges and other bought components. These will be added to the parts list which is an aspect of the working drawing. List the advantages of producing a parts sheet. How does a working drawing and parts list differ from a parts sheet?